← The Equinox Row, March 22nd, 2013. 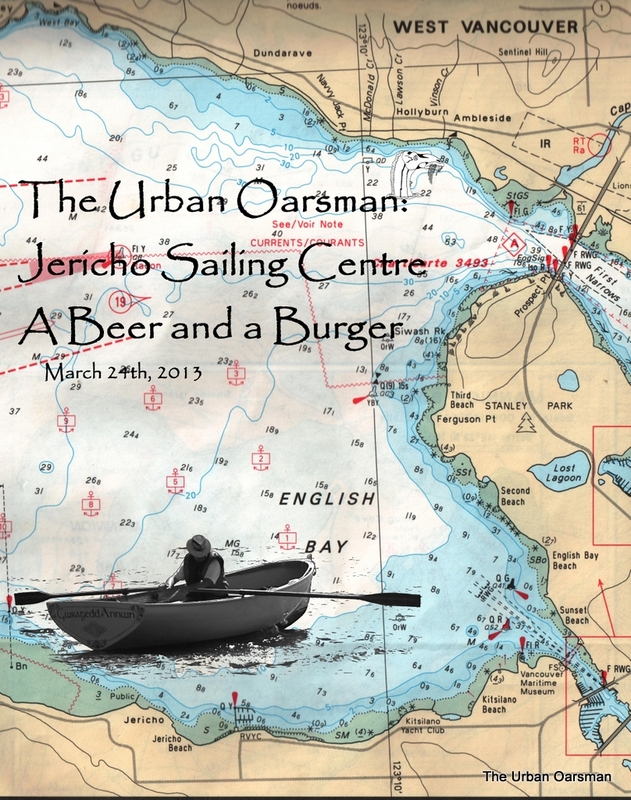 Jericho Sailing Centre Row….Around the Freighters, there and back for a Beer and a Burger. March 24, 2013. 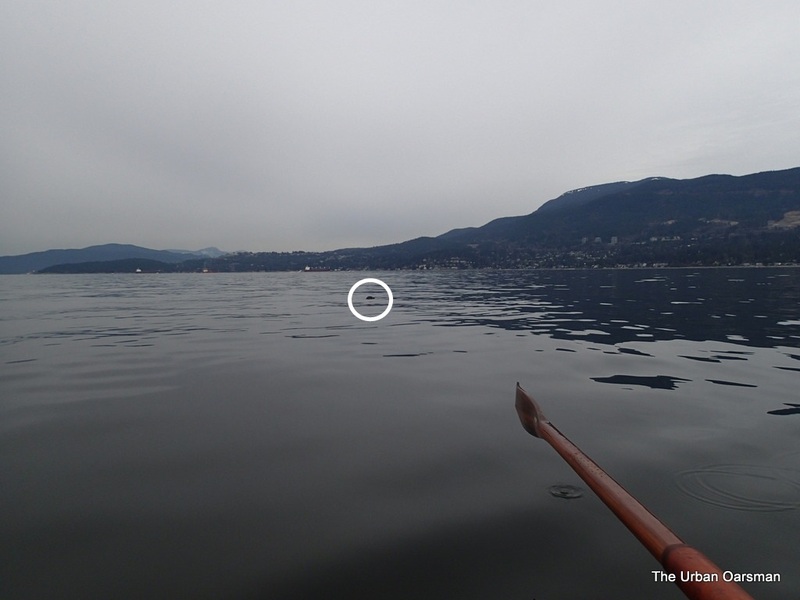 I am going to row from Hollyburn Sailing Club at Ambleside Beach, West Vancouver, to the Jericho Sailing Centre at Jericho Beach. Note the red anchor squares with the numbers in them. I will be rowing by some of the freighters anchored at them. 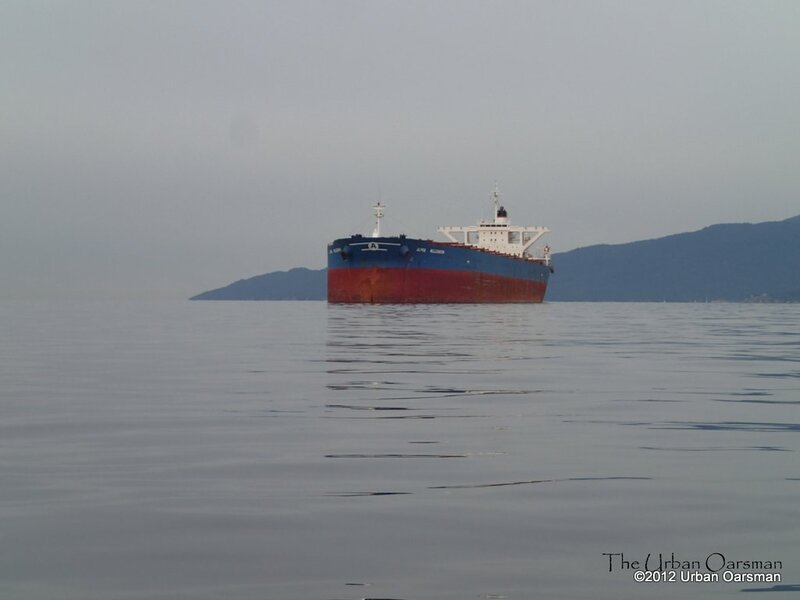 JSCA is 3.6 nautical miles South West from Hollyburn. My rows to JSCA due to the tides and winds have averaged almost 5 nautical miles each way. I will get lunch at the Galley Patio and Grill. It will be a long row so I have extra cushions for the main thwart. The High Low tide is at 11:08am, at 2.5 meters, the Low High is at 4:35 pm, at 3.8 meters, and the Low Low is at 10:54 pm, at 1.7 meters. There is only a 1.3 meter rise in the tide at Vancouver today. I should not have a fast run of tide to cross off Ambleside. 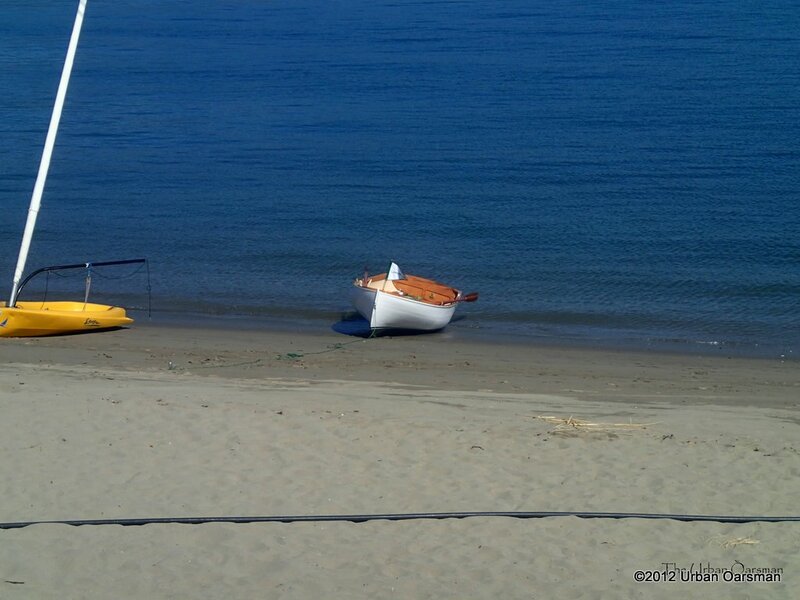 The sea is flat, there is almost no wind. I should average three knots rowing across. Nine-thirty in the morning on a crisp day in early spring. The marine weather prediction is for a flat still day. 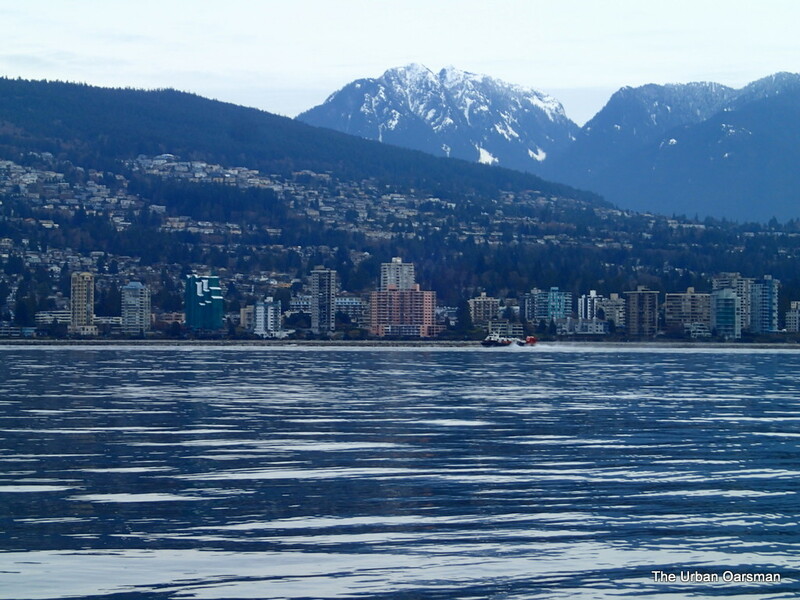 The Coast Guard Hovercraft came out of the inner harbour and flew along the West Vancouver waterfront at high speed. Here is the Hovercraft in front of the famous “Pink Building”. It is marked as an aid to navigation in the Vancouver Harbour paper chart I have. When my high school buddies and I sailed from Hollyburn Sailing Club across the Strait of Georgia to Qualicum Beach in 1975, the building was painted pink and pink it still is, thirty-eight years later. 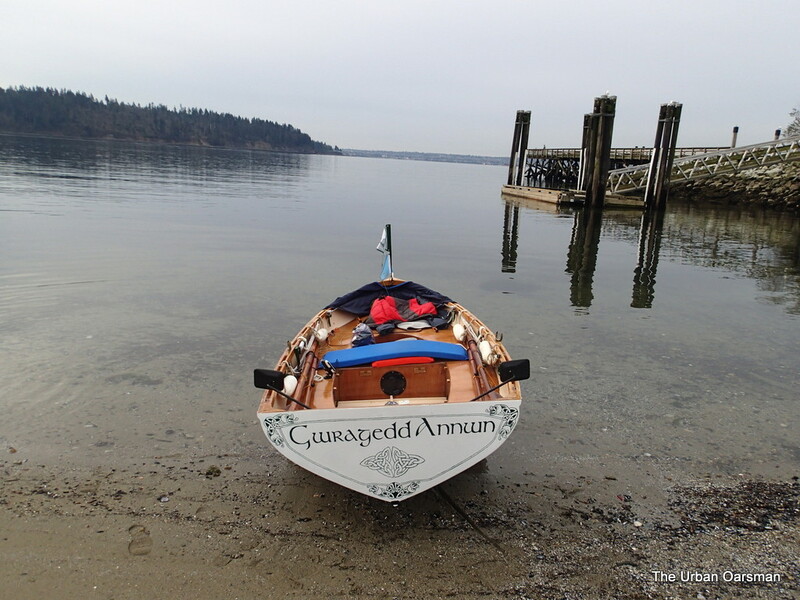 Gwragedd Annwn heading south across English Bay towards the Jericho Sailing Centre. The Grey and Blue freighter is the “China Steel Excellence” registered in Kaohsiung. 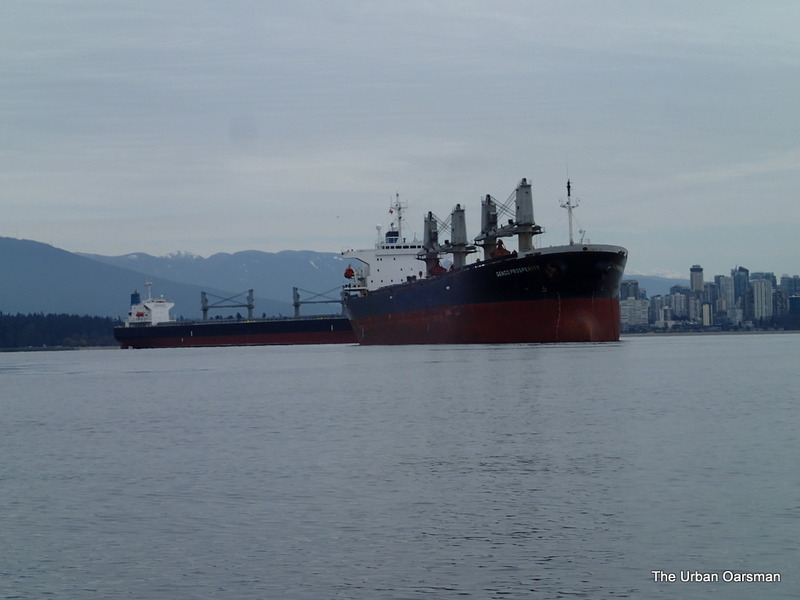 Many of the freighters anchored in English Bay are light, waiting to be loaded. Quite often I get a seal or two following me as I row. There always seems to be a few off the Ambleside fishing pier. There are always a few fisher-folk feeding them there. 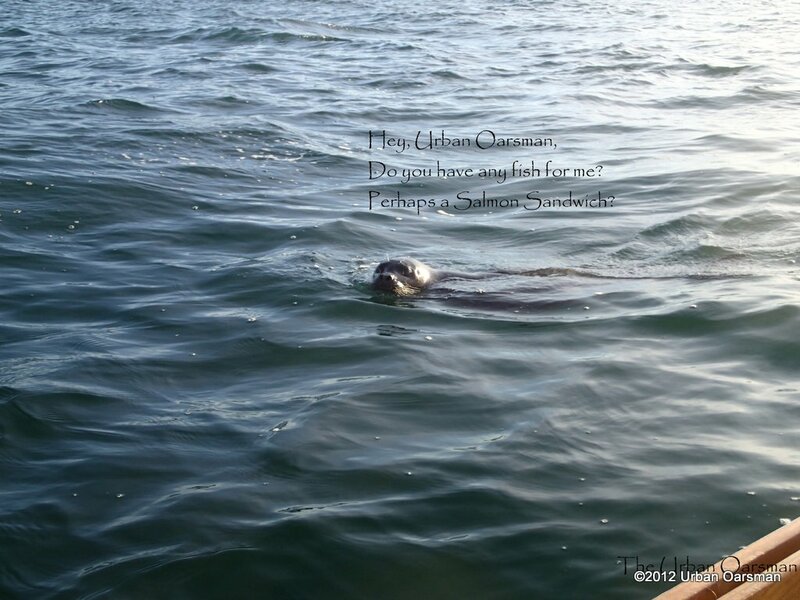 I believe that because my boat is travelling slowly, the seals think that I am trolling and looking to steal my fish. But the joke is on them, as I have given up trying to catch fish when I go out. “Sorry seals, there will be no Salmon from me for you to take”. “Go back to the Ambleside fishing pier and let the fisher-folk feed you there”. The following Seal with puppy-dog eyes looking for a fish. Coming closer for a fish, but I have none. I leave the seal behind, salmonless and pass the “China Steel Excellence”. Does she have any other sister ships? The “China Iron Excellence”? or the “China Copper Excellence”? or perhaps the “China Coal Excellence”? 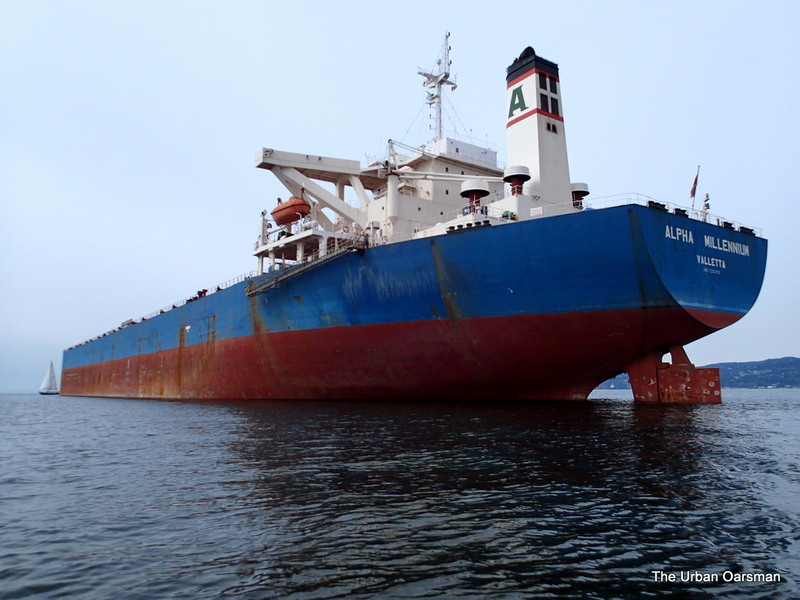 Quite often in the winter, there will be over a dozen freighters at anchor in the bay. 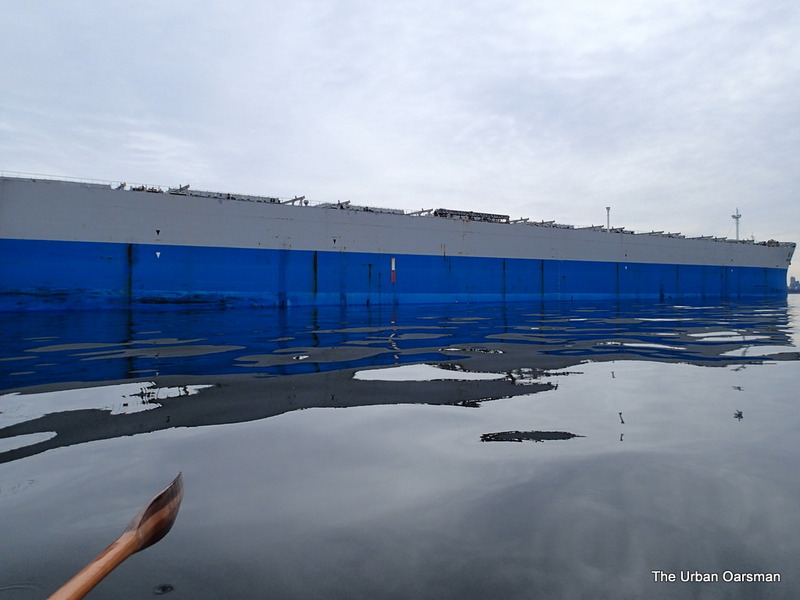 Every now and then a small aluminium crew boat will race out to a freighter with a pilot. You have to be cautious rowing by them as they may start up, hoist anchor and sail into the inner harbour. Freighters underway are very fast. 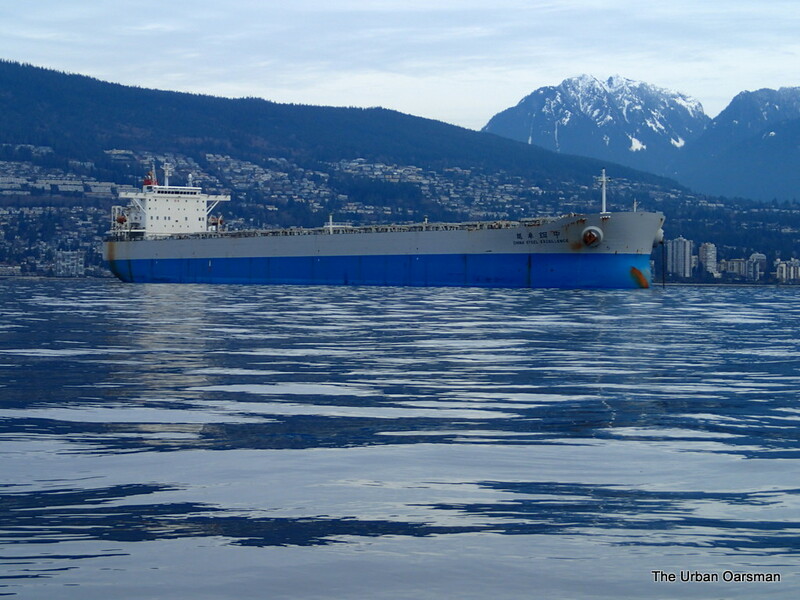 If I see one off of Point Grey, it will be coming under Lions Gate before I can clear the shipping channel. A freighter is easily ten times faster than I am in Gwragedd Annwn. Stern shot of the China Steel Excellence. She is looking a little rusty today. I do not like to get too close to the freighters, as they will never see a boat as small as mine and can become active with little notice. 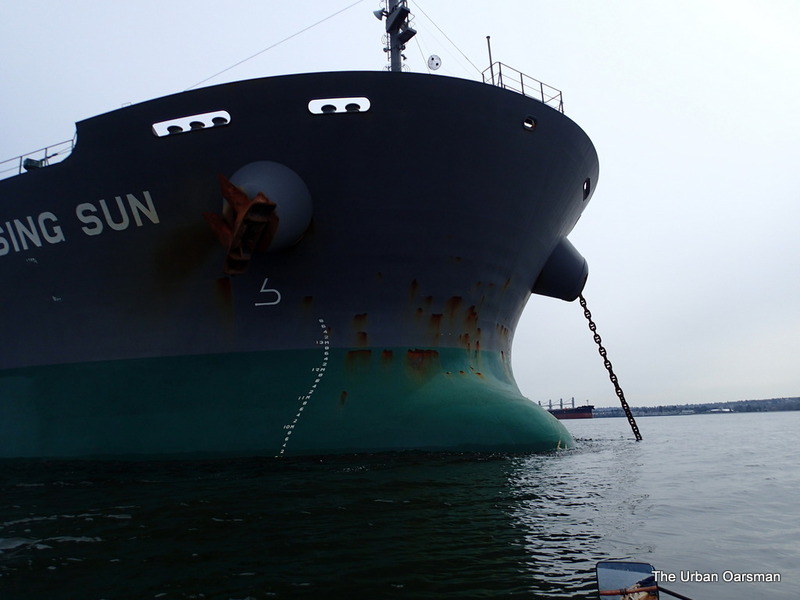 Bow shot of the China Steel Excellence, showing her bulbous bow. 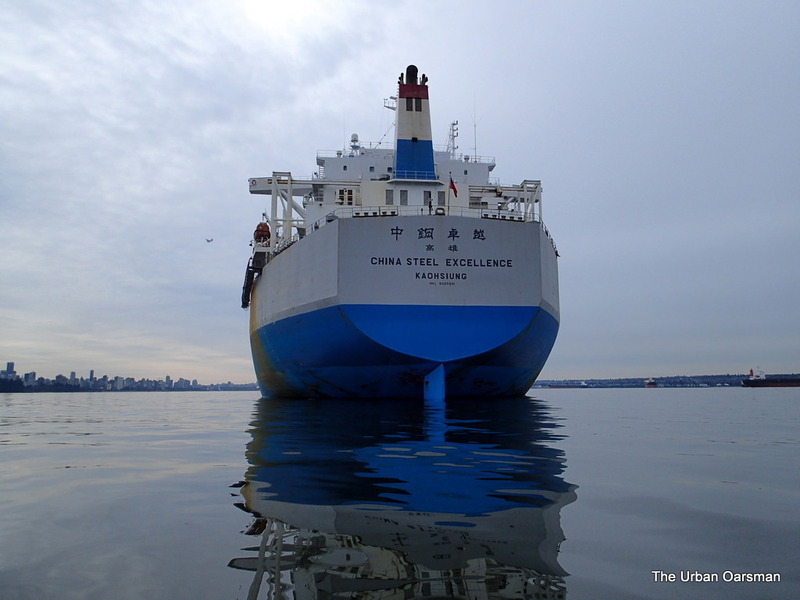 The China Steel Excellence’s bow is actually quite flat. I wonder what happened to give her that rust spot on the bow. Hit something? There are many forms of bulbous bow in the bay today. Bow shot at distance of the Alpha Millennium. 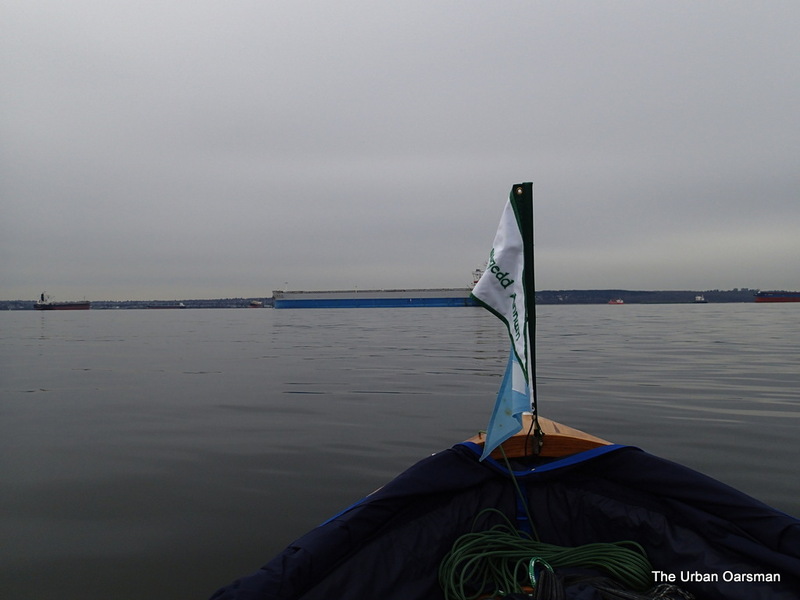 I continue rowing south towards Jericho Sailing Centre, with many more freighters in the way. The Brilliant Trader is drawing about 6.2 meters of water. The freighter will draw 14 meters when full. 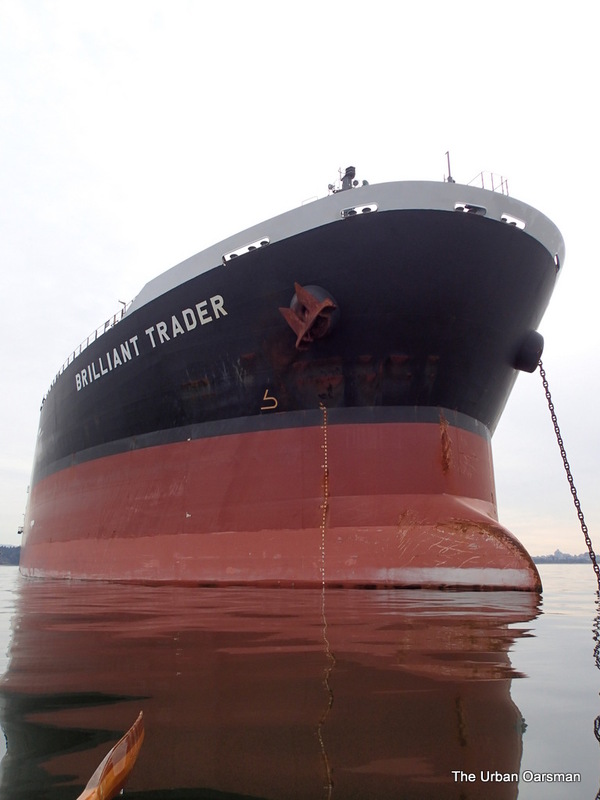 Close up shot of the Brilliant Trader’s bulbous bow. The Anna Dorothea, I pass her by on my Starboard to her Port. She has one of those “Roller Coaster” lifeboat launching systems. 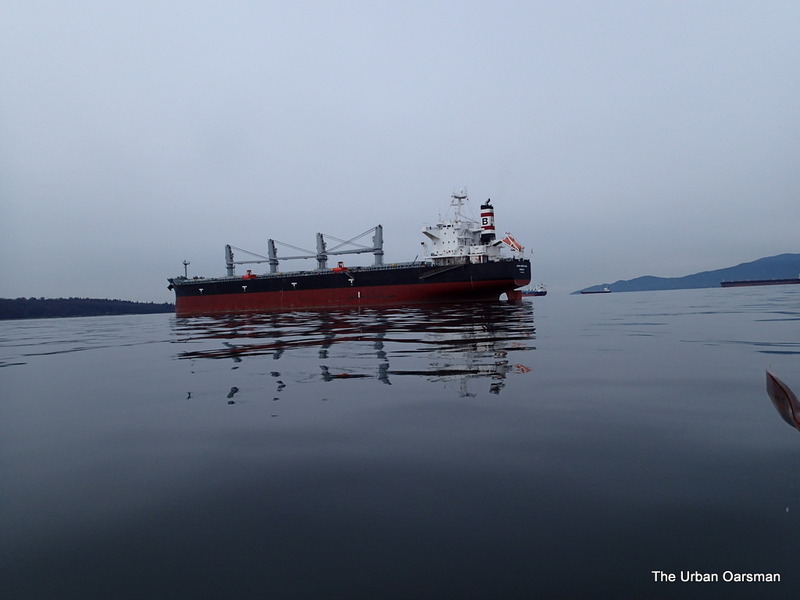 On my Port side, towards Stanley Park, the Genco Prosperity sits on her anchor. She has her lifeboat slung by davits. Astern of the Genco Prosperity another freighter awaits on her moorings. She too has her lifeboats on davits. I row on towards Jericho. I am almost across. 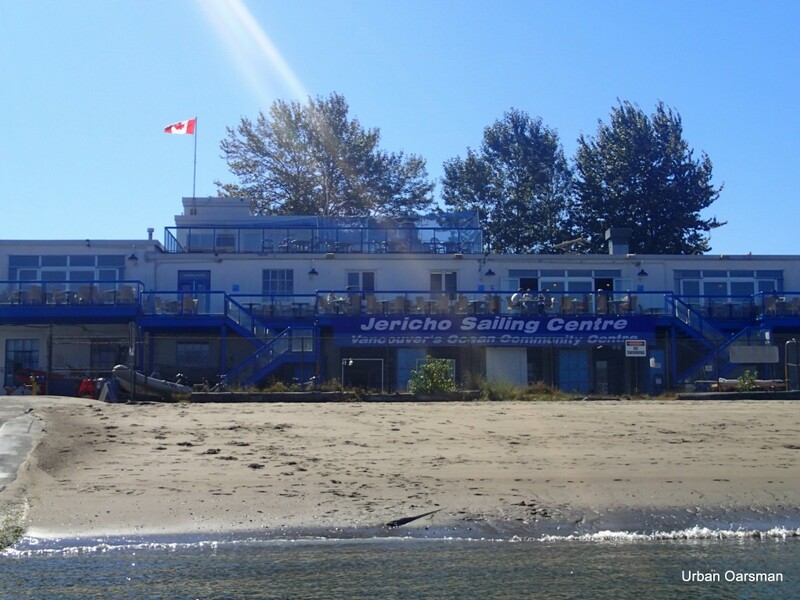 I am going to have lunch at the Jericho Sailing Centre Association Restaurant, The Galley Patio and Grill. A beautiful day but the Beer and the Angus Burger are uninspiring. Perhaps Oarsmen should only eat here for the view. Gwragedd Annwn on the Beach at the Jericho Sailing Centre. I have a special sand anchor to hold her here. It is a large tent peg from Mountain Equipment Co-op that you use to pitch your tent in the snow. It is called a Bulldog 31cm Snow Stake. Costs $1.75 plus tax. Works great. You need to have a thin line or make one of the holes in the tent peg bigger. Two views of my sand anchor. Note that the top hole has been enlarged for a 1/4″ rope. I have used this sand anchor for many years at Jericho. Probably the best sand anchor around for the cost. This one has been fine for me so far. Mountain Equipment now has a bigger snow tent peg, but for a lot more money. It is called a Picket Snow Anchor. There are two, one about $19.00 and a larger one for about $24.00. 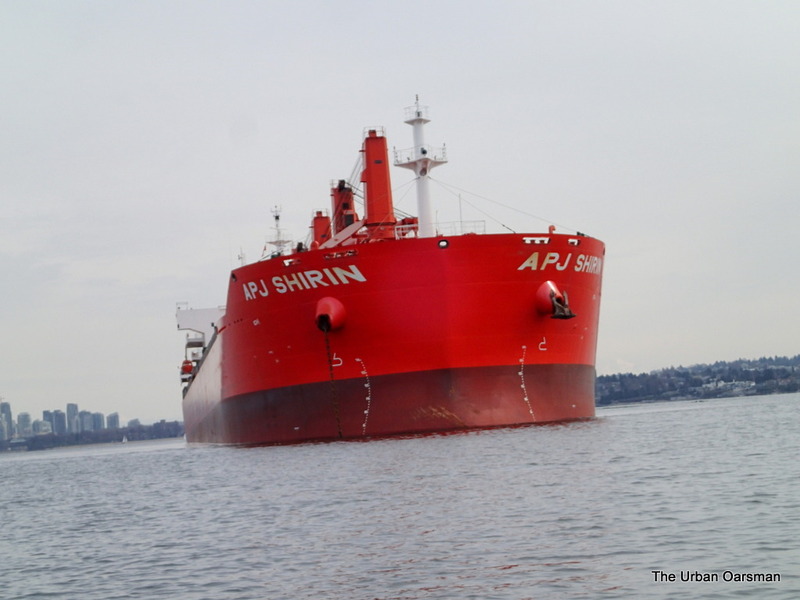 On the return trip to Hollyburn, I pass the APJ Shirin. With her orange/red paint job she is hard to miss. She too, has her lifeboats on davits. She looks to be drawing about 8 meters. Still has some cargo? Water Ballast? The current flowing into English Bay past the anchored Rising Sun. Note the angle of her anchor chain. She is drawing nine meters. There is a lot of pressure on her anchor. The current is flowing into Burrard Inlet at about two knots. I am making pretty good time back to HSC. With the incoming tide and my own boat speed, I a doing better than four knots. 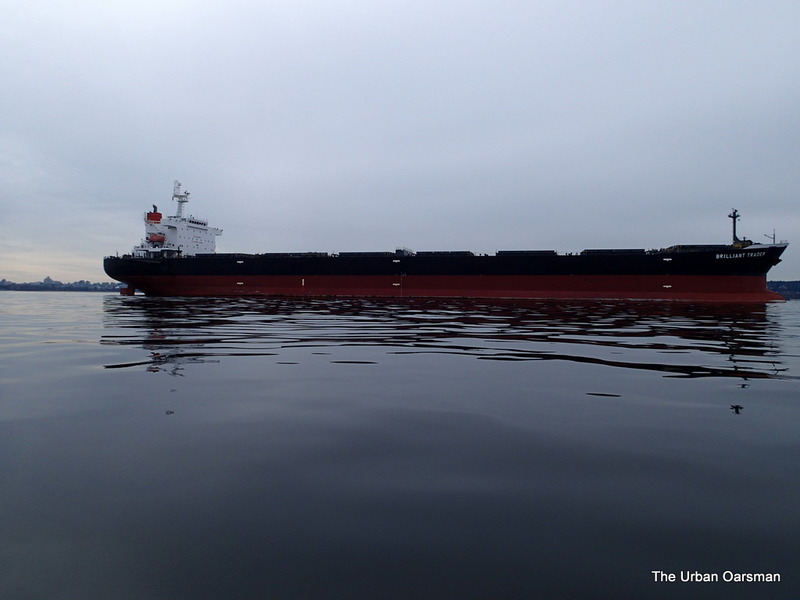 I leave the freighters behind and make the shipping channel crossing to Hollyburn.